Former Manchester United defender Gary Neville says his ex-club's game against Liverpool on Sunday could be "like the Dog and Duck versus The Red Lion". Neville, while working for Sky Sports, likened the fixture to a pub game. He also claimed the Red Devils "got away with murder" in an unconvincing 2-1 win at Southampton on Monday. "He can say everything as he is an ex-legend, but as an ex-legend, or legend, you have to know what you are saying," said United boss Louis Van Gaal. "He has to pay attention to his words." 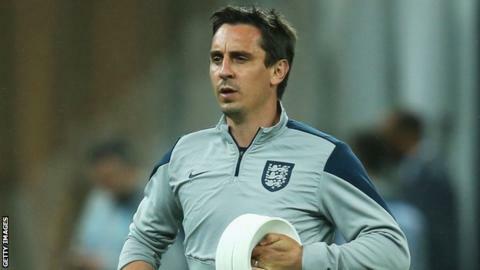 However, Neville denied any talk of a rift between him and Van Gaal. He was asked on Twitter: "The press mentioning a feud between yourself and Van Gaal. What feud?" And Neville responded: "One that will be created that doesn't exist." Van Gaal conceded his team were "lucky" to beat Southampton as they registered a fifth league win on the trot. The win moved United to third in the Premier League going into the game against fierce rivals Liverpool at Old Trafford. The Reds are ninth in the table as they have struggled to match their exploits from last season when they finished second.